Set in modern Mexico City, the world that Silvia Moreno-Garcia taps into is contemporary, with one exception: since the 1970s, vampires are very much known to be lurking in the shadows among humankind. They’re outcast and even outlawed in many countries, including Mexico—but like any force of nature, they have their ways of getting around. Despite all this detail, Moreno-Garcia refreshingly avoids the well-worn trend of establishing a confusing clutter of vampire clans, hierarchies, families, factions, and histories; what ultimately matters is that they all have one thing in common, and that’s their unmistakable, unquenchable hunger. The novel never slows down or becomes too exposition heavy; it’s suspenseful, character-driven, and powerfully emotional. From the first page, the reader is introduced to Domingo, a young man who collects and trades garbage for a living, and who is utterly fascinated with vampires. An avid fan of comics, books, and movies about the fanged beings, he has an aloof, pop culture-informed perception of them. So when he meets a real vampire, a beautiful young (-looking) woman named Atl, he is fairly star struck. Atl, meanwhile, doesn’t want company, from Domingo or anybody else. A Tlāhuihpochtli, she doesn’t trust other people, human or otherwise. She would rather walk through life alone, save for the company of her genetically-modified Doberman named Cualli (who is very much a character in his own right). Yet Domingo insists, with naïve, even childlike persistence, that Atl and he could at least be friends; and so she reluctantly allows him into her life, and a most unusual companionship begins, even as the mysterious and occasionally terrible darkness of Atl’s past comes creeping back into her present, eager to devour her and Domingo both. Atl struggles to restrain herself to somewhat civilized behavior around Domingo (not for a lack of patience). She’s perplexed by his appreciative words and kind gestures, and how they make her feel—but these feelings are juxtaposed with her bloody instincts to abandon or even outright kill (and naturally, exsanguinate) her faithful companion. Moreno-Garcia’s knack for creating three-dimensional characters doesn’t stop with the protagonists, either; she renders realistic portraits for all of her characters, no matter how prominent or brief they may be. Nick Godoy, the spoiled son of a revered Necros criminal kingpin, has his vengeful eyes set upon Atl, for transgressions that are only very gradually revealed. And although his desires and behavior are very much despicable and tunnel-visioned, he is painted in a very realistic and believable light. Human detective Ana Aguirre is struggling to scrape by in a male-dominated police force, even with her bittersweet reputation as a vampire killer. She dreams of a better life for her and her teenaged daughter, but those dreams seem far out of reach, and only getting farther away when a series of vampire killings hits the streets. Even Rodrigo, Nick’s “Renfield” (a human companion, though not under control of blood magic) is treated as more than just a background figure; he’s simultaneously a obedient servant and a wizened, ornery elder of his petulant vampire master. The setting, meanwhile, is every bit as much of a character to the novel as the humans and vampires who populate it. Even for all its alternate history, it’s a very familiar and vividly described backdrop. With its many subtle descriptions, readers from any location can see, hear, and even smell the streets, subways, slums, and plazas of Mexico City. This book has drawn comparisons to the works of Anne Rice and other authors of literary, character-driven vampire fiction. Yet Moreno-Garcia never shies away from the bloody darkness that is inherent to these beings, with some truly grisly scenes of violence and bloodshed. Certain Dark Things does for vampires what Stephen Graham Jones did for werewolves in his novel Mongrels earlier this year: beautifully and powerfully reinvigorates one of the seminal horror fiction monsters in some truly unexpected and sublime ways. Filled with powerful themes of trust, corruption, vengeance, and bloodlust, this novel is by turns sensual and grim, introspective and disturbing, suspenseful and moving, and all told in the sleek and lyrical prose for which Moreno-Garcia is deservedly acclaimed. 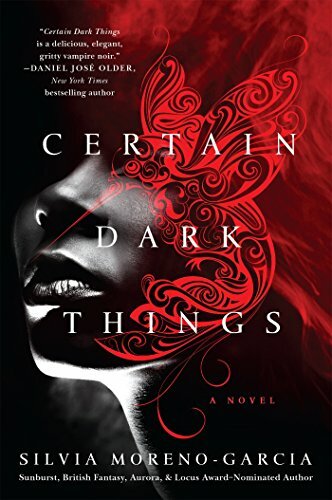 In short, Certain Dark Things is arguably the vampire novel for the 21st century. Barry Lee Dejasu has written book reviews for publications such as Shock Totem.